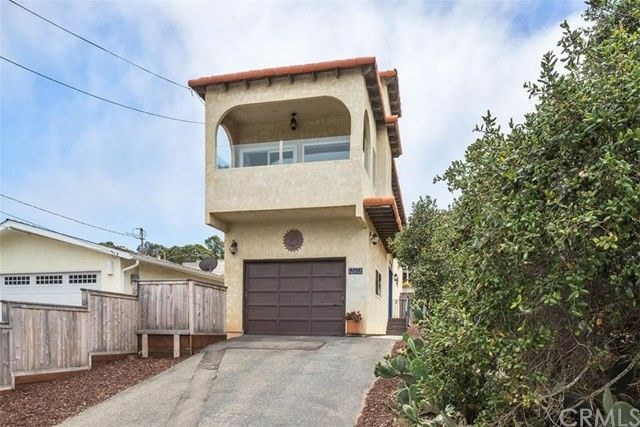 Located in Cuesta By the Sea youâ€™ll find this lovingly maintained, comfortable home offering a low maintenance lifestyle with a multitude of upgrades for you to enjoy. From the engineered wood floors to the vinyl, dual pane windows, LED lighting, updated kitchen and bathrooms this home has so much to offer. Upstairs youâ€™ll immediately notice the abundance of light flowing in through the surrounding windows giving you the feeling of living in the tree tops. The balcony off of the living room allows for some outdoor living space - perfect to enjoy the peeks of Morro Rock and the bay, great for a bbq, or a place to sit and enjoy morning coffee or an evening beverage while watching a sunset. The kitchen has been upgraded including stainless appliances, custom light wood cabinetry and pantry, solid surface counters and a breakfast bar for convenience. The dining area provides a spot for more formal dining along with a huge cupboard for added storage. The 2 bedrooms are generous in size with plenty of closet space. The downstairs bedroom has its own private bath and patio. The 2 bathrooms feature tile floors, updated vanities, and stylish lighting. The oversized 1 car garage is an added bonus with washer/dryer hook ups and additional shelving. All this located close to the Cuesta Inlet - and just a short distance from Sweet Springs preserve.